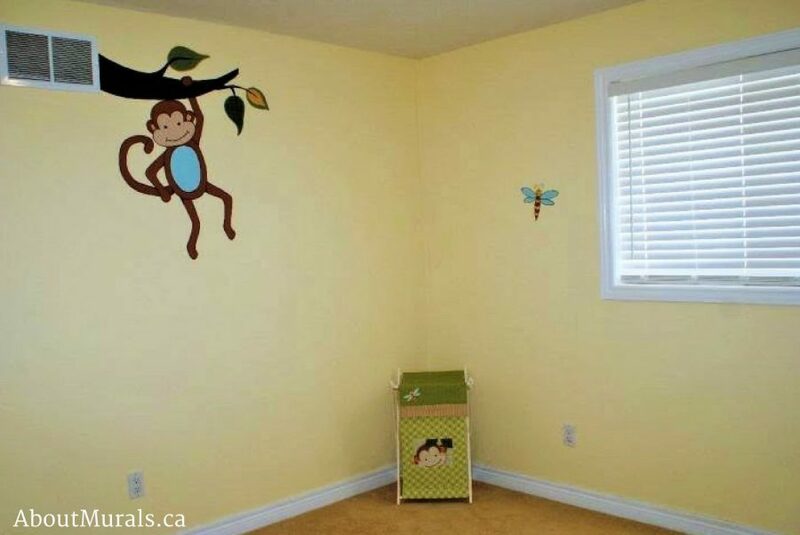 Although this rainforest mural was painted in Stoney Creek, Ontario, I also sell adorable animal wallpaper murals that ship for FREE in Canada and the USA. 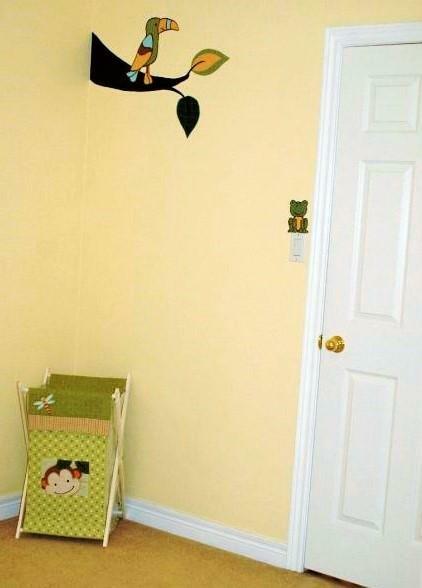 They are quick and easy to hang and come right off the wall when you’re ready to redecorate. 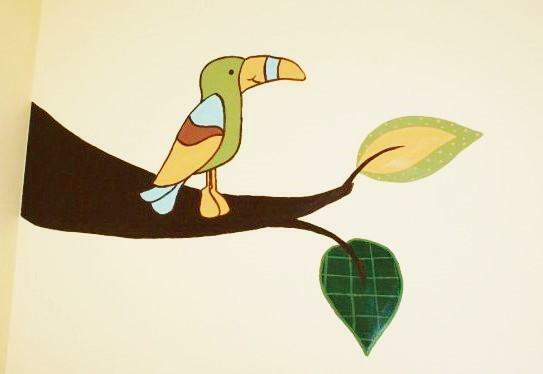 Thinking of a rainforest mural for your kids bedroom? 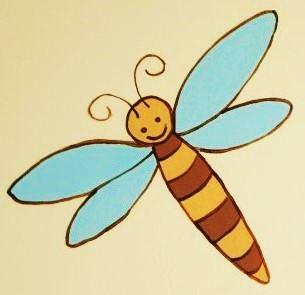 Here are some photos of a mural I painted for a little girl so you can get some ideas. This mom and dad wanted to design a neutral nursery because they didn’t know if they were having a boy or a girl (I later found out they had a girl – yay!). We decided to use the crib bedding as inspiration for the rainforest mural. Why not use eyesores (like return air vents) and work them into a mural so they’re not so ugly! 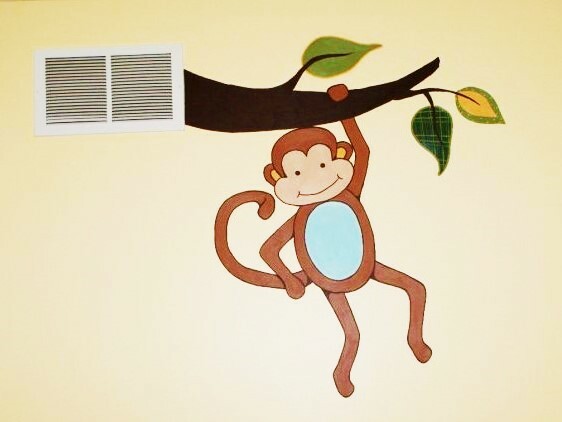 I painted a tree branch for the monkey to swing on, coming out of an air vent. The crib would eventually sit under the monkey, giving the newborn baby something to look at while she was awake. I love all the plaid detail in the crib bedding, so I made sure to add some of the texture into the rainforest mural when I was painting it. The toucan on a tree plaid tree branch is nestled in a cozy corner of the room. 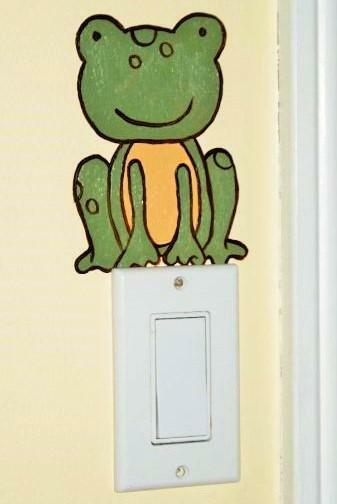 The frog in the rainforest mural is a friendly and fun way to remind them to turn the lights off! 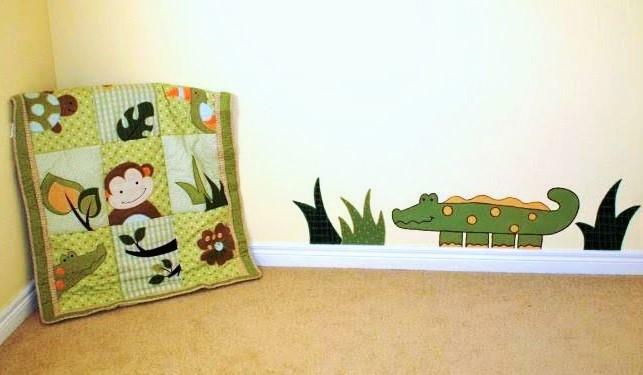 The alligator in this rainforest mural was painted low to the ground so the baby would have a friend to keep her company while she plays with toys and reads books. I paint all of my murals with non-toxic acrylic paint and no-VOC latex paint, so the air quality is safe for your kids to play and sleep in – even the night I finish painting. All of my wallpaper murals are eco-friendly, too. Still thinking of a rainforest mural and like my style? Let’s work together! I’ve painted wall murals, from Toronto to Niagara Falls, since 2005. I even had the chance to paint a mural for a Mike Holmes TV Show! Join my newsletter community and I’ll send you all the latest promotions and maybe even a hot coupon or two!